My oldest cat Babe, now about 15 years old, just wasn’t acting normal. She had not been very active, had been drinking much more water than normal, and was urinating a lot with most of it being deposited on my floors instead of in the appropriate place. She had never done this before. I thought old age was finally catching up with her until I ran across an article on feline diabetes; Babe had all the symptoms. Now, a trip to the vet for an exam and some testing. The vet did a quick blood test to check Babe’s blood glucose level. It was high so some lab tests were run to check for other problems, to determine for sure that she was diabetic and what type diabetes she had. All tests confirmed that the old girl had Type II diabetes so Babe and I were in for some big changes in our lives…. My Vet briefly explained the options I had and a little of what would be needed to conduct my own cat diabetes treatment. He informed me of a fairly new treatment for feline diabetes using human type insulin that may let the cat’s pancreas begin working normally so that insulin injections may not be needed in the future if all went well. I now had to decide if she was to be put to sleep or if I wanted to learn to do all the things necessary to treat a diabetic cat; like drawing blood for testing, how to give injections to a cat that wasn’t going to like this a bit, the changes needed in her diet and many other things necessary to care for her. There was lots to learn about feline diabetes, glucose meters, syringes, insulin, testing, etc. The decision wasn’t too hard for me to make. Babe has been around so long and has been such a good friend for so many years that I had to give her the chance to go on awhile longer. For the next few weeks Babe would need her blood glucose level tested at the Vet’s clinic three times in one day each week; that’s three trips in one day plus three Vet bills, in one day. This was to get the diabetes stabilized, to see how she responded to treatment and to determine the right dosage of insulin needed. By the fourth week I couldn’t see an end to the three times a day testing and had now learned enough that I could monitor the glucose level and adjust the insulin dosage myself. The medical bill on Babe had now reached around $1,000. No misprint, thousand. So Babe and I were off on our own and going in monthly for a check up. My Vet gave us a lot of extra help on how give injections, testing and tips about how to care for Babe. I also found a lot of needed help on the internet. By learning most of the basics in the beginning, you can most likely reduce your expenses a lot. Babe is now getting two insulin injections daily and doing well. She is much more active, grooming herself more, not drinking nearly as much water and disposing of the waste water in the appropriate place. She also isn’t as cranky and I can tell that she is feeling much better. She will venture outside occasionally sniffing around in a cat way hoping for some small prey to catch and bring to me. We have now worked out a regular schedule for testing and injections but there were some minor problems and adjustments to be make along the way. As for the wetting on the floor, she hasn’t done this since the first treatment for diabetes. I think this was her way of telling me she needed help…she knew I would care for her. Drawing blood for the glucose level test is about the worst part of the whole cat diabetes treatment procedure. Babe just didn’t want any part of this so she howled, growled and did a little clawing too. The most convenient place I found to get the tiny drop of blood needed for the test was from an ear; this was the only place I could reach while trying to hold Babe in my lap, sticking her ear for the blood sample and using the glucose test meter. I really needed at least one more hand or a helper would have been nice. This would be three times daily for a while anyway. Just as I would get the drop of blood needed from an ear, Babe would shake her head and there would go my sample flying off to some place where it was not needed. Now, let’s do this one more time. After a few weeks Babe’s glucose level was stabilised and staying within a normal range so once daily was all the testing needed for now with a monthly trip to the Vet for a checkup. Babe and I were both proud of this as I had much rather stick myself for the sample as to fight with Babe. With some practice and patience things will go much smoother and is much easier with someone around to help. Babe is tolerating things a little better also. If you have or find yourself with a diabetic pet don’t be afraid to jump right in and go to work. There will be a lot to learn but most anyone can do it. It’s not as complicated as it first seems, it just takes a little time and patience. There may be a few hair pulling times but you will soon realize that your efforts are paying off. Unless you are willing to take on the responsibility of caring for a diabetic cat, or are rich and live next door to a Vet, you are the only one who can help your cat have a longer, healthier and happier life with diabetes. You will be glad you did. Caring for a diabetic cat will be a whole new learning experience. You will have to learn how to care for the cat, what type of meter to buy and how to use it, how to get a blood sample, how to give an injection and a lot about feline diabetes. A good place to start is the internet, there is lots good information available. Using a blood glucose meter is very easy, the hardest part here will be deciding which to buy as there are many available and all claiming to be the best. The truth is that they all are about the same, work about the same way. They are mostly used as an indicator with regular testing done by your Vet for more accurate results. One of he first things I learned about glucose meters, the hard way, is that a human meter is not the best choice for use with animals. I’ve seen information that says they can be used to accurately test animals and perhaps some can but that has not been my experience in treating Babe with the human type meter that I initially bought. It can be used as an indicator but be aware that the reading may be far off from normal. I only found two meters specifically for testing animals but there are likely more available. One was expensive and the one I bought as a kit with everything necessary to do testing for cats and dogs was an iPet purchased from ADW and is marketed for veterinary use. The complete kit cost $42 USD and has done a good job so far. The price of the same meter can vary greatly so shop around. Whatever meter you purchase, be sure and check the price of the test strips for that meter before buying it. Nearly all meters use a different test strip and the price for them can vary greatly. The meter may be very low priced and the test strips be very expensive. A complete test kit would be the best option to begin with as it will have everything needed with instructions. The first step in testing should be to get everything organised and ready for use. Next, the blood sample; it can be a challenge to get from a cat who mostly didn’t want you disturbing it’s nap to to start with. The ear is the best place I’ve found to stick for a sample and after a few tries you should be able to easily get a drop of blood from it. By shining a light inside the ear, you can see the tiny veins. The larger one at the outside edge has been the easiest for me to get a sample from. The lancet device holds a small pin within it that does the stick automatically and is easy to use; just put in in place and press the button for a nearly painless stick. When you see the drop of blood touch the test strip to it, with it inserted in the meter, the test strip will absorb the sample, wait a few seconds for a meter reading. Follow the instructions provided with the devices you are using. Have your vet to go through the testing procedure with you using your meter. He can do his test at the same time and the two meter readings can be compared. It has been my experience that no two meters will read the same, especially different brands, and their readings can vary a good bit from each other. If in doubt the safest thing would be to consult you Vet. Run through the test procedure a few times on yourself to get used to working with it, it’s practically painless. Note: If a cat is upset or mad, this can cause it’s glucose level to increase. If your vet will work with you and let you adjust the insulin dosage at home you can save a lot of the expense of taking your pet to him repeatedly during initial treatment. He can instruct you as to the dosage he thinks is best for your pet or you can use a chart showing recommended dosages (see link). Take the chart to your vet and discuss this with him or he may have a different one. Anytime you are not sure of something check with your Vet. If he is not willing to work with and help you, there is another one somewhere who will. A pet that is overweight, gets little exercise and is fed FOODS HIGH IN CARBOHYDRATES are the main causes of feline diabetes, I’m sure old age fits in here somewhere also . A cat’s body does not process carbohydrates in the way our human body does. Because of this the blood sugar increases eventually resulting in diabetes. Just changing the cat’s diet can sometimes cause the pancreas to start producing insulin again thus lowering the glucose level. Insulin dosage may need changing as the glucose level changes and may reach a point to where the cat’s pancreas is working normally so that injections will not be necessary. Nearly ALL dry cat foods are high in carbohydrates no matter who makes them or how much they cost (see food comparison chart link below). Some of the higher priced foods don’t come out to well. My Vet suggested that I start feeding my diabetic cat one of the high priced name brand foods he sells that is recommended for diet control. I looked at the can label and saw that it didn’t list the amount of carbohydrates it contained; this seemed rather important to me and something being left off a label usually indicates to me that something is wrong. The food cost $3 per 5.5 oz can, this is about $9 a pound plus it was 78% moisture meaning the cat has to eat a lot more of it to get full; I can feed Babe a diet of good quality hi-protein meat for less than this…I may be able to take Babe to a Restaurant cheaper. I am currently feeding Babe a diet of chicken, turkey, some canned fish and supplement this with good quality canned cat foods. She is doing well on this diet. Caring for your diabetic cat will be a new challenge and will take some patience, planning, and learning some new things. With a little effort you can accomplish all of this in a short time. Your pet will live longer and have a healthier, happier life and you will be glad that you helped it get there.Oh…Babe is doing well and my blood pressure is returning to normal! The links below have some good information on caring for and treating a diabetic cat plus some sources for buying diabetic supplies at lower prices. There are many other sources, these are just some good ones I’ve found. broken link at Feb 2011. Many thanks to all the folks listed above for providing all the information that I know is helping my furry little friend live a longer and healthier life and to Pictures of Cats for all the information they provide that helps all our pets. 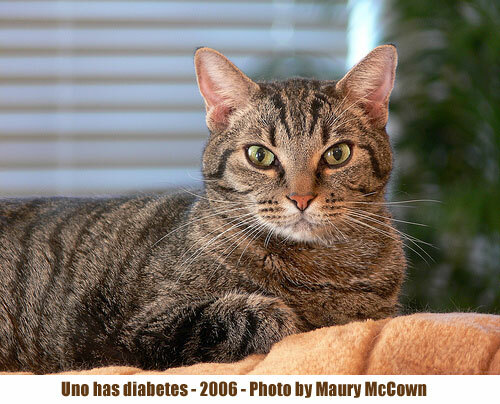 This entry was posted in Cat Health, diabetes and tagged cat diabetes, cat diabetes treatment, cat health, cat obesity, feline diabetes by Michael Broad. Bookmark the permalink. I was wondering if it’s the fact that you have diabetes that makes you overweight/ obese or if just being overweight increases your chance to be diabetic which is why most diabetics are fat. So my question is is it diabetes that causes obesity or obesity that cause diabetes or both? I think the jury is our on that question but it is probably a bit of both and for cats it appears that the if a cat is diabetic and obese the cause is likely to be overfeeding of dry (high carbohydrate) cat food. Type 2 diabetes would almost vanish from the scene if people would stop feeding their cats dry kibble loaded with cheap fillers which are carbohydrates/sugars. Thank you Carol for a comment that I completely agree with. We need to get cat caretakers to be more aware of the downsides of dry cat food. It appears that the manufacturers are not concerned.